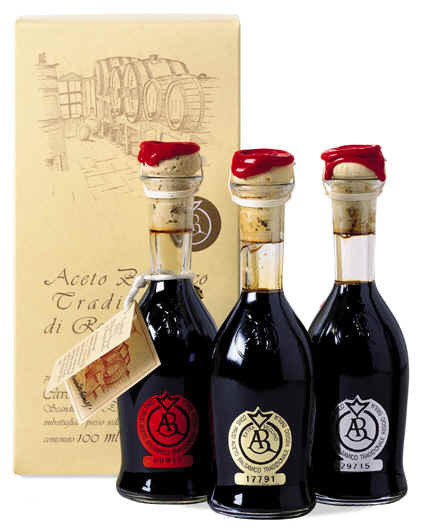 We are pleased to offer you Cavalli's Reggio-Emilia Tradizionale Balsamic Gold Label, Aged not less than 75 years! The Cavalli Red Label (aged at least 12 years), Cavalli Silver Label (aged at least 18 years) & Cavalli Gold Label (aged 25 years or more) & the distinctive bottle & packaging are hallmarks of a Reggio Emilia Consortium-approved Extra Vecchio Tradizonale balsamico. The Consortium governs the use of the protected designation 'Tradizionale', in addition to upholding standards for taste & production of same, specific to the province of Reggio Emilia (versus Modena, which has its own Consortium, issuing its own set of regulations, classifications & standards of bottles & packaging. Cavalli Gold Label Tradizionale Balsamico.